Rather than suggesting weight and substance, like many traditional sculptures, Neil Dawson's works represent lightness and transparency. They are often hung high above the audience so they can be both seen and seen through, and are created from materials such as steel mesh and carbon fibre. 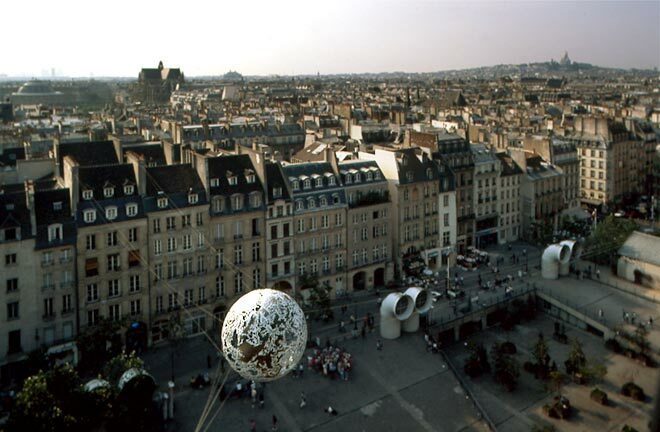 'Globe' (1989), seen here suspended above the Musée National d'Art Moderne (the Pompidou Centre) in Paris, is a prime example of his accessible yet revolutionary outdoor sculpture.